You know about my faulty oven, right? (In case you don’t, click here). I shouldn’t say it’s faulty actually; it works perfectly fine. Just a royal pain to use. It’s so stinkin’ old, it sounds like it’s preparing for take off every time you preheat it. The oven doors have no springs. And the temperature is bizarrely off, but it’s nothing an oven thermometer can’t fix. Oh, and it’s a double oven. I get all of these lovely benefits x 2! I use the extra space to store the 8 million muffin tins and cake pans that I own. Life just got a little bit easier. Wolf Gourmet sent me a shiny new countertop oven! It’s not a typical ‘toaster’ oven like you might assume. It’s a serious top-of-the-line beauty. If someone shrank a professional Wolf stove, red knobs and everything, that’s what it looks like. It’s got all the bells and whistles to boot. I’ve used this oven extensively, and I can honestly say, it’s awesome. These days, I prefer it over my regular oven, as I’ve become increasingly lazy when it comes to unloading all of my baking paraphernalia every time I want to make muffins. My favorite feature is the proof setting. If you like to bake bread this will allow you to speed up the dough rising process. I believe it’s set to 80 degrees F.
My regular oven doesn’t go that low, so it’s a plus when you’re pressed for time. Mix the dough and place in your countertop oven adjusted to the proof setting. Or, leave it in a warm sunny spot to rise until it has doubled in size. Once fully risen, gently flatten the dough and cut into 14 strips. Roll each strip into a log and tie into a knot. Think: tying your shoelace (minus the bow). Place the knots onto your baking tray (I used the one that came with the oven). Brush with olive oil. Pop them back into your oven, same setting, to rise again. They should looked slightly puffed, not dense. Bake for about 15-20 minutes until golden. While still warm, toss with a mixture of melted butter, garlic and fresh parsley. 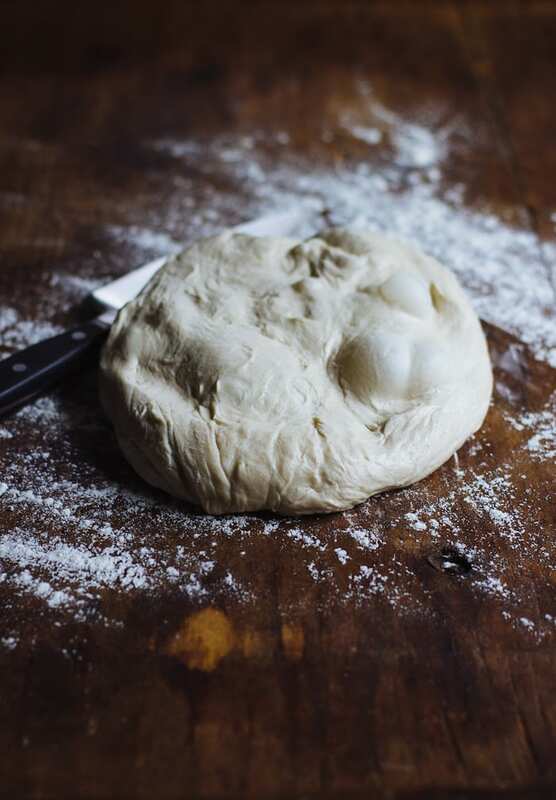 *Note: If you are pressed for time, you can purchase a ball of good-quality dough directly from your local pizza shop. Or, check your grocery store in the prepared food section. Then, proceed with the recipe starting at bullet point #4. To the bowl of an electric stand mixer, add the water, yeast, sugar, and 1 tablespoon olive oil. Let it sit for about 5-10 minutes, or until little bubbles start to appear on the surface. Bubbles indicates the freshness of the yeast. Then, add 2 cups of the flour and the salt. Fit the stand mixer with the dough hook (or paddle attachment). Run the machine, low speed, to combine all of the ingredients. While running, add additional flour a little bit at a time, until the dough comes together into a ball. Continue on low to 'knead' the dough, about 3-5 minutes or so. It should look smooth. Coat a large glass mixing bowl with the remaining 1 tablespoon of olive oil. Add the dough. Place a damp kitchen towel over the top and leave in a warm sunny spot to rise. It's ready when the dough has doubled in size. This can take anywhere between 1-2 hours depending on how warm the temperature of your kitchen is. Alternatively, place the bowl of dough (uncovered) in an 80 F oven (or 'proof' setting for Wolf countertop oven). This will speed up the rising process. Once fully risen, turn out the dough onto a lightly floured work surface. Gently flatten. Cut the dough into 14 equal strips. Roll each strip into a short log. Tie into a knot (think: tying your shoelace, minus the bow). Place onto a parchment lined sheet pan. Brush with olive oil. Place back into your oven, either proof setting or 80 F to rise again. This time, they will only need about 30 minutes. They should look slightly puffed, not dense. 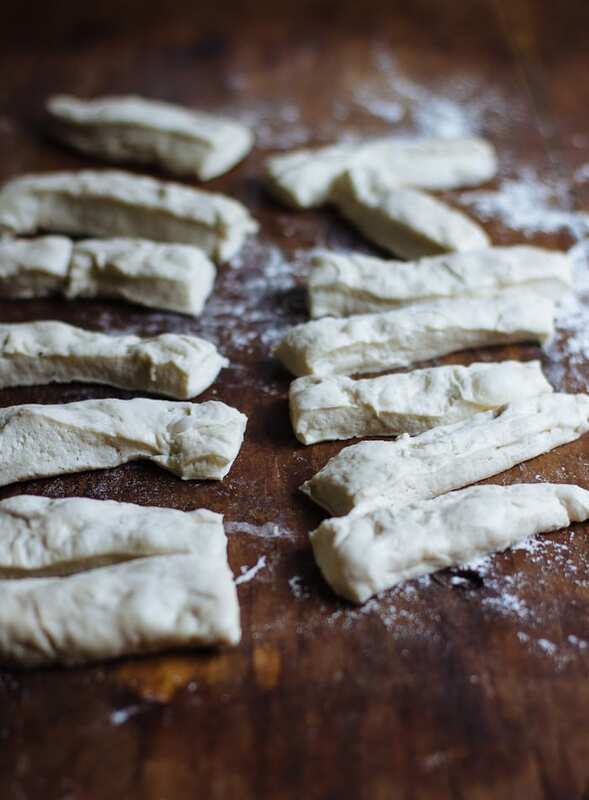 To bake the knots, increase the oven heat to 400 F. Bake for about 15-20 minutes, or until golden. Meanwhile, prepare the garlic and herb mixture. In a small pot, melt the butter over low heat. Add the garlic and a pinch of salt. Give it a quick stir, about 30 seconds - 1 minute. Do not burn the garlic. Add the parsley and remove from the heat. 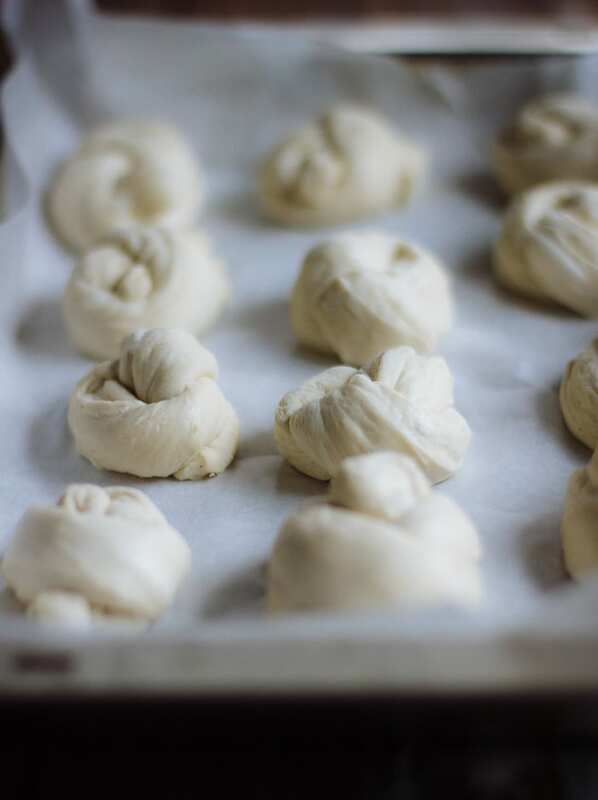 When the knots are fully baked, cool on the tray for about 5 minutes. Add them to a large bowl. Pour some of the garlic and herb mixture over the top. Toss to combine, adding more butter as needed. To serve, sprinkle with a generous amount of parmesan cheese. Enjoy warm. I would loooove to make english muffin pizzas. A personal favorite. Those knots look absolutely lovely. The proof setting of the wolf oven also sounds fantastic- my apartment heat is controlled by management (so it’s pretty irregular), and my oven also does not go that low. Wow that proof feature sounds amazing and just what I need to try to conquer edible Gluten Free bread! I’d love to have this oven, so when I am only cooking for one, I don’t have to heat up my “big” oven! I cook for myself everyday, but often just microwave, so I don’t heat up the whole kitchen with my regular oven. This countertop Wolf would be so appreciated!! I would love to test-drive the Wolf Gourmet countertop oven by proofing and baking a focaccia in it! Can’t wait to try to garlic knots recipe soon. I think that another oven would be a fabulous thing to have in my kitchen. I make many different kinds of sourdough recipes and having a proofing oven would be fantastic. They you for the always inspiring recipes in your blog. My stove is a 1928 Roper that works perfectly, however, the Wolf would look beautiful on my counter and would be perfect for summertime baking when I don’t want to super heat our kitchen. I can taste those yummy garlic knots! Oh, I’d love to try the bread proofing in it. And then, aside from garlic knots, an open face toasted pb sandwich . . .
Would definitely try the proof feature, and make some cinnamon rolls! I would LOVE the Wolf oven. Since moving to mile high Colorado my bread baking has really suffered. Between ultra dry air and the altitude it has been a challenge. I think good proofing would solve most of the challenges – and it sounds like this oven has the solution. Those look delicious!!! I love anything with garlic in it!!! I would make those in a new countertop oven!!! And pies, and cakes and all sorts of goodies for the upcoming holiday season!!! Delish! I would bake smoothie muffins in my new oven for my tots! I want to use it as a second oven and for smaller items liked baked potatoes. Your garlic knots you divine. I would love using the Wolf oven for proofing. And since it’s a countertop height, my daughters would be able to use it with ease. Thanks! I am a subscriber. I would use it instead of my full size stove since I only cook for one. the first thing I would make is roasted winter veggies. What a great giveaway thanks! I have always been intimidated by baking with yeast and think it is time! I would start with proffing the garlic knots. I know this oven will look great in my kitchen. I’m a subscriber. If we had the Wolf oven, I’d tackle Biscotti for holiday gifts! I love garlic knots! Especially when they come straight from the oven – so perfect! I am going to try these knots; they look yummy! Ah – winning this would be so fabulous! Perhaps I can even perfect my homemade pizza recipe. Thanks for the offer! Oh, my, a proofing setting? I would love that! First thing I would make is homemade rolls. And these look delicious. A proof setting? A bread makers dream! These look so incredibly delicious! I’ve always wanted a Wolf oven, and this counter top version, would be perfect for holiday cooking. I would LOVE to make these knots, lots of cookies and a few sides during Christmas! 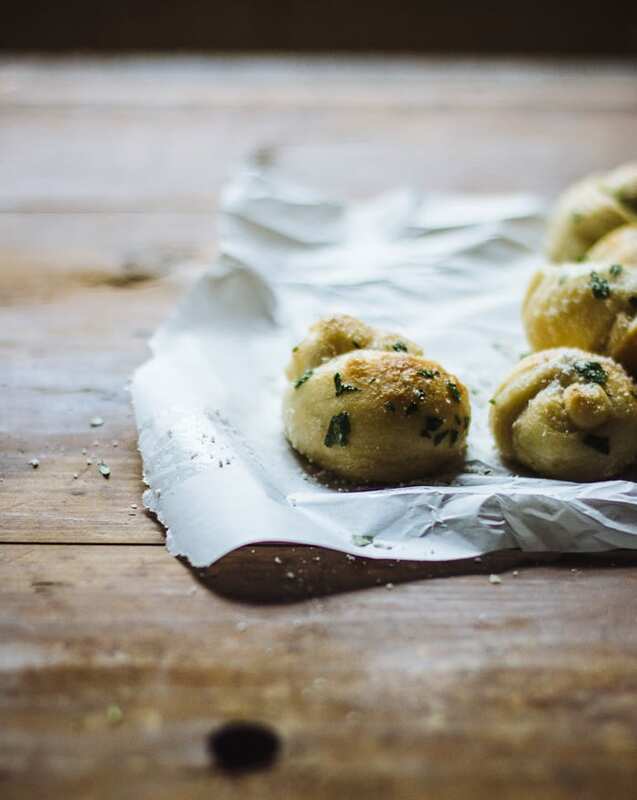 Hmmm… Why I’d like to make these garlic knots, of course! They look simply delish! I would love to make baked oatmeal muffins and eggs muffins! I have a Prime Rib in the freezer begging to be roasted. Yumm! That oven! And this garlic knots.. absolute perfection! cookies, pies, and crackers in the countertop oven! These garlic knots look superb! I bet they are super tasty – your breads always are. And the oven sounds great! I think a batch of brownies would be a good start for a new counter oven. I’ ve been a subscriber for awhile and have enjoyed making many of your excellent recpies. Should I be the lucky winner’ my very first recipe would be yeast based. I’d love to experiment with the proof setting (it always cool in my beck of the woods. Finding a warm place to proof yeast dough can be challenging. Thanks for the generous give away! These look amazing, and the oven is gorgeous (and looks super practical, too)! I would love to use this to proof my dough– I bake a lot of bread! 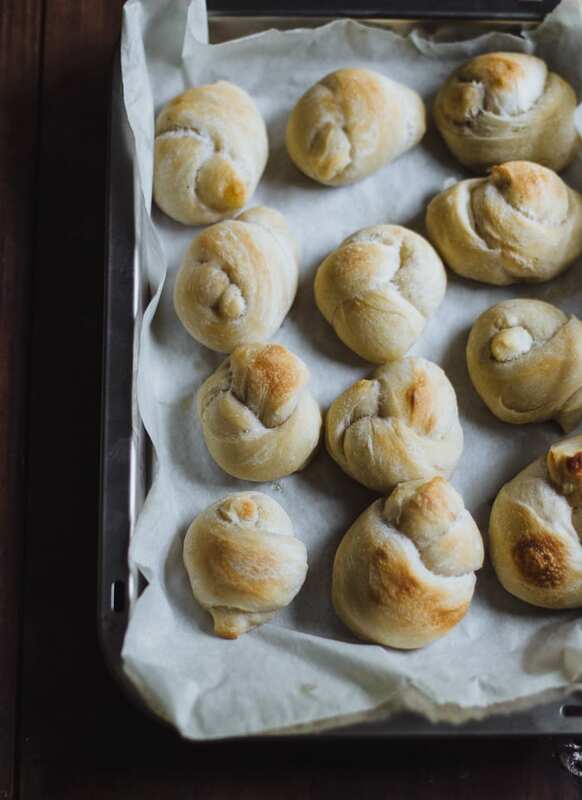 These garlic knots look delish and I am very jealous of the Wolf Gourmet Oven! I would LOVE to make all kinds of ANYTHING in the oven. But the first thing I would make would be hummingbird cake. Yummy! I have a batch of frozen brioche that has sticky buns written all over it!! I don’t have an Instagram account, but that oven looks great! I bake a lot of sourdough bread, in fact we’ve stopped buying sandwich bread all together. I would love to shorten my proofing time, especially in winter. A proof setting sounds awesome. I like the way this oven works. Those look absolutely delicious. I would love to make homemade mini pizzas in it! I have honestly never made my own dough so I am a bit frightened. Such an awesome oven, funny because I have been wanting a countertop oven for a while now. Fingers crossed! I have some fresh pizza dough that this will be perfect for! I’d love to proof my challah in it! 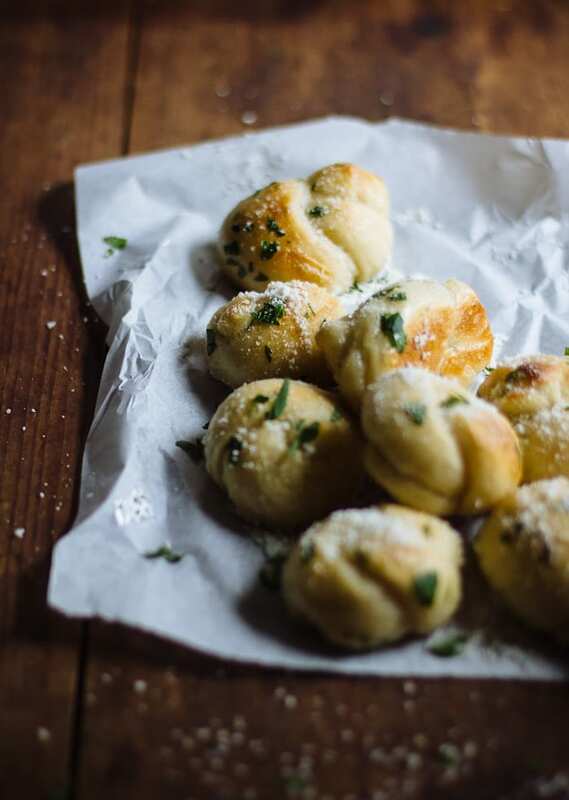 The parmesan garlic knots look sooooo yummy! I can’t wait to try your recipe. I love following your blog and have tried many of your recipes and brought them to parties. I’ve received many compliments and requests to pass on the recipes. I’m always looking forward to your next post. Thank you! I would love to win the countertop oven! It would be so helpful during family gatherings when I just can’t fit everything in my oven. My favorite thing is making cookies at Christmas! It’s been a tradition since I was a child. I bake several varieties which takes me all day considering I have just one oven. Winning this countertop oven would allow me to bake twice as fast! Yeah!!! I am signed up via email and Instagram! Thanks for the chance and I so need this! I love the garlic knots above! They look amazing! The garlic herb mixture sounds good to rub on homemade rolls. I have a brand new echoey huge empty nest….and I am now cooking just for my husband and me! This will be nice to make smaller portions. 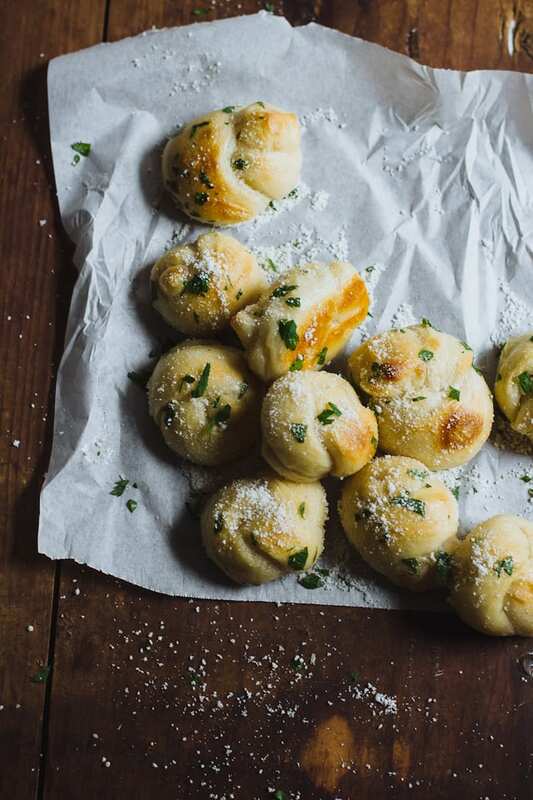 First off, I am drooling over these parmesan & garlic knots. Seriously! How good they look Emilie! Second, I almost never sign up for giveaways but I did for this one. Because it sounds AMAZING. PS: Proof setting?!! for real! These garlic knots look amazing! I would love to have a countertop oven because I also use my current oven for storage. And it’s not fun to unload everything just to use the oven when this size would be perfect! Thanks so much for the opportunity. I follow on Instagram as lillycamp1, thanks. And yum, yum on the rolls. And I thought my stovetop/oven was bad! You lucky girl to get the Wolf countertop oven. I too have to use a thermometer and have no springs on the oven door! Glad to have found your lovely blog. I follow you on Instagram (@ginger_krueger). Love the blog! I would love the oven for all of my baking needs, seriously! Mine is on its way out, because I literally use it a few times a day everyday, so it’s starting to fall apart (not the best quality either of course.) When I only have to cook for two, there’s no reason for me to heat up the big oven, especially in the summer. I couldn’t live without because I use it for toasting, baking, roasting, warming up. The Wolf Gourmet one looks amazing, and so durable, which to me is one of the most important things now When looking at ovens like this . I follow you on Insta and just subscribed! Love your bog! I would make PIZZA for days in this beautiful oven! I would make some cinnamon rolls!! Ooo, I have to make them today. My daughter will devour them-wish I had that proof setting. Do you use regualre flour or bread flour? I would love to make baked doughnuts and brioche for my family in that countertop oven! It is beautiful!! Can’t believe it proofs! Thank you! The proofing feature on this oven would sure help my winter bread baking! There’s no place in this old, beloved, but COLD house in winter just when bread baking is needed to warm up the spirits! Thank you & enjoy your breads! I can never say no to garlic knots. Just love love it. You know, I always bake my stuff in a small oven, so convenient. Are these as good as they look??? I definitely want to try these. Thanks for posting. Great pics! Gorgeous, and I love that you incorporated fresh herbs. We often do bread loaves of various shapes and sizes, but rarely rolls, never knots. Time to make a change! Thanks, and cheers to your new addition!